Voters in in Virginia's 33rd state senate district are just days away from casting ballots in an election that could shift the balance of power in the general assembly. The district runs from Chantilly through Herndon, Sterling and ends in Leesburg. The Jan. 21 special election will fill the state senate seat left open after Democrat Mark Herring was elected attorney general. Three candidates are on the ballot. Democrat Jennifer Wexton is a former prosecutor. Republican John Whitbeck is a Leesburg attorney and state GOP official. Joe May, a long-time former Republican state delegate and business owner, is running as independent. All three have had to hit the ground running, squeezing a campaign into just a month. "It's been breakneck first of all because you do have a very narrow aperture to reach the people," May said. In spite of the condensed time frame, all three candidates have phone bank operations, dozens of door-to-door volunteers and television ads. What's at stake is political control of the Virginia Senate, whether it shifts from Republican to Democratic hands. Right now Republicans hold 20 of the 40 seats, Democrats,18. But because former Democratic state senators Ralph Northam and Mark Herring won statewide office, there are two special elections. A Democrat won the first in the 6th district but a recount is expected there. The second special election in the 33rd district. If Democrats win both special election, Democratic Lt. Gov. Ralph Northam will hold the tie-breaking vote. If the GOP claims one of the seats, the party maintains control. Democrats have poured money into Jennifer Wexton's campaign hoping to give Gov.Terry McAuliffe a Demoratic senate to work with. She's been able to buy ad time on local network television while her opponents spots air only on cable stations. 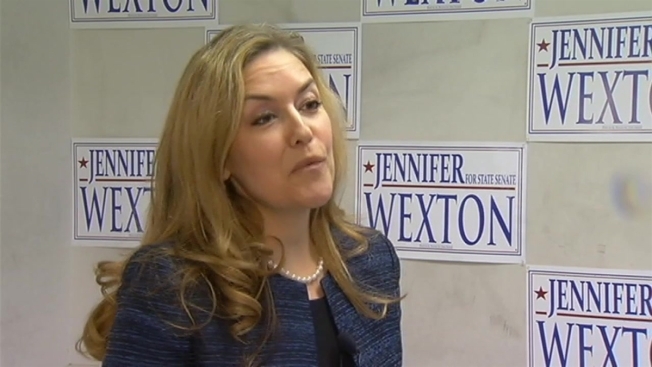 Wexton has continued a campaign theme used successfully by McAuliffe and Herring last fall. She's casting her GOP opponent as someone would erode women's reproductive rights. In Wexton's campaign literature, Whitbeck is pictured alongside Ken Cuccinelli, who lost his bid to become governor. "Nobody can ignore the attacks on women's health that have been coming out of the Virginia General Assembly over the past couple of years. That's not what people believe the government should be focusing on," Wexton said. "People want the govt to be making our schools be the best they can be, helping fix our transportation problems, concentrating on jobs and growing our economy." Republican Whitbeck says Wexton has distorted his position. "This is a campaign that's saying we want to outlaw most forms of contraception which is just absolutely false," Whitbeck said. Whitbeck argues he'd provide a check on Democratic initiatives like Medicaid expansion. "We're campaigning on stopping the tolls that are punishing our commuters everyday, we're campaigning on stopping further tax increases on families and businesses and working against the expansion of the affordable care act in Virginia," Whitbeck said. A GOP delegate for more than two decades, Joe May lost that seat in a Republican primary. He believes his vote in favor of the transportation funding plan cost him his seat. He says if he wins he'll caucus with Republicans but vote his mind. "One of the things I can offer is independent thinking and independent action," May said. "I've been a Republican all of my career. I've been very independent in in some of my votes and I have the latitude in which I can vote my conscience and not be held up by paralyzing partisan politics." Like Whitbeck, May is concerned about escalating tolls on the Dulles Greenway. If elected, he says he'll continue to pursue a plan in which Virginia would purchase and take over operation of the toll road. Turnout is expected to be low in the special election. All the campaigns have been pushing hard to have supporters who qualify use absentee ballots. At Loudoun County's election offices, workers say the effort seems to be paying off with 50-60 requests a day for absentee ballot applications. The deadline for requesting those passed Jan. 14 but in-person absentee voting continues until Jan. 18.